Whenever we asked my sophomore English teacher how long he expected our writing assignments to be, he would respond by saying, "Like a woman's dress: long enough to cover every thing, but short enough to be interesting." I think he would have liked how Twitter's limit of 140 characters forces you to say what you want in a very concise manner. One Forty or Less fully embraces this with the motto "the complexities of life in brevity." I'm finding the practice is starting to rub off in other areas. My emails are shorter, my PowerPoint slides have less words, and the other day in a long meeting I started playing a Twitter game in my mind, keeping track of who could "tweet" their points in brief sound bites that influenced others. 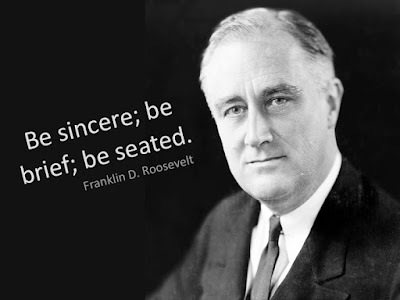 Being brief has always been preferred as stated in one of my favorite quotes from Franklin D. Roosevelt. So on top of all the other great benefits you've heard about tweeting, now you can add it helps you practice the fine art of concise communication.